Ok, we’ve only been on Twitter for a year now. But while that may not sound like much, it means we had a social media presence pretty much from day one of being in business (not bad!). Since then, we published close to 1,000 hand-picked tweets and established a community of about 500 individuals and brands. To celebrate the occasion, we had a quick look into some of our Twitter analytics which we are sharing below. We typically tweet about 3x a day and earn between 16k-20k impressions per month on average. Our best performing tweets get up to 5,000+ organic impressions. Most of our followers are male (77% vs 23% female). Our audience is tech savvy, or at least super interested in science and technology. Since we share links, articles and captions in English only, the majority of our community is based in English speaking countries with around 10% living in northern Europe. Our top followers have upwards of two million followers. 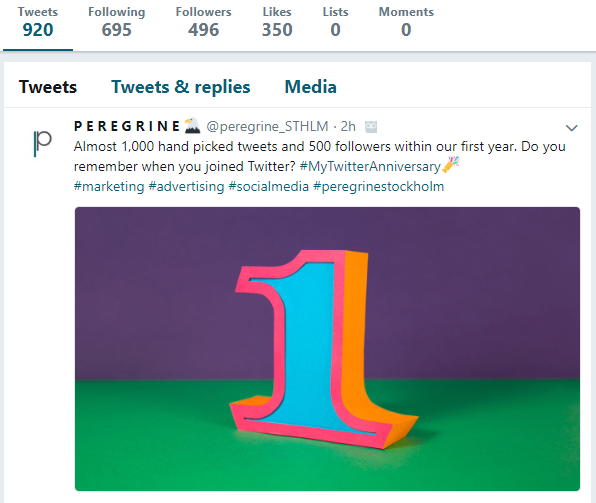 Our content mix is about 80% external industry relevant highlights and 20% Peregrine specific news, primarily from our blog (peregrine.se/news). Our tweets are from reputable sources and our goals is to keep our audience up to date on trends within digital marketing, share high quality how-to articles, local industry events etc. We would love to get your feedback around what you would like to see more or less of since we run our Twitter account primarily for you! While the external links we share help establish our brand as a valuable resource for further reading and analysis, our blog links and profile visits via social also lead to significant traffic to our own website. As far as traffic acquisition is concerned, Twitter ranks on number 3 in sessions from social sources while all social traffic combined accounts for about 1/5 of all site traffic for peregrine.se (snapshots below from Google Analytics). If you are a customer of ours, you already know how much we believe in a strong social presence for your brand awareness building, reputation management, customer service, talent acquisition (we hire almost exclusively via LinkedIn ourselves) and to allow for a glimpse into your company culture etc. Not all social channels are equal of course. They all have individual qualities (e.g. around use of links, hashtags, length of caption, preview, picture dimensions, rich media formats etc.). If you need help with your social strategy or execution, contact us. We would highly recommend you take a look at our LinkedIn and Instagram to learn more about our team and activities. As always, if you have any questions, we’re just a click (or tweet) away.